So Terrible. Must Stop Laughing. A cavalcade of bad nativities and it's 2004 predecessor. Of course, anybody who passionately hates the "art" of Thomas Kindade pleases me greatly. I'm not much of a fan of nativity scenes, but I found one at a certain "Junk-of-all-kinds" type store that was the life-sized inflatable kind of nativity. Very tack-tack-tacky. What does Fisher-Price do with all the leftover Little People they manufacture? My older children are convinced their little brother is a highly verbal genius. Every time he makes a noise, I hear voices shouting, "Mom! Did you hear that? He said..."
Every time I am not in the room, my one year apparently has taken to having long conversations with his brother. Probably about the difficulties of finding good sisters these days or the unlikelihood that anyone other than Shakespeare really penned the Bard's plays or perhaps how far they could shoot something of their sisters' across the room. Brothers, of course, have so many topics of conversation. It's true that the one year old is quite the mimic. Say anything around him and he'll get a big grin and try to repeat it. There are only a few things I'm willing to count as words yet, "Noooooo" and "Dee" (for "three" which my husband says as he rockets the baby around the room and which the child will run up and shout gleefully if he finds you lying in a position that reminds him at all of the rocketship game). He sometimes correctly says "Mama" and "Dada" but even those don't seem to be clearly specific, as far as I'm concerned. Nevertheless, his siblings translate volumes of his sayings and let me know what he's thinking. My seven year old sagely confided in me the other day, "What they said on that public television parent tip is true. You should talk to your babies a lot." "Only if you actually want them to learn to speak," I said. I hate to be the one to break it to you, but you don't have a seven year-old these days. D'oh! I can't keep track of them any more. I appoint you the official Adams' family census-taker and demographer. Although I'm glad I didn't take the handmade Christmas pledge, because I would have failed miserably, we are making a few presents this year. The kids and I made stupid sock creatures for my niece and nephew. Those weren't hard to make, but they were time consuming. I've been at a loss as to what my mother-in-law would like, but finally I remembered something I saw a link to a while back. I'd tell you where if I could remember, but I don't. It was a tutorial on making silhouettes. 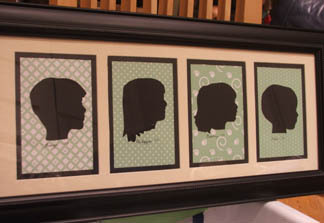 Now a real silhouette is done with someone snipping away freehand, and it is really cool to watch. This is not that way, but rather something that requires no real artistic talent. First, I took a photo of each of the kids' profiles up against a blank wall. Okay, first, I really went to Michael's bought a picture frame with a matte (my supply of millions of them being packed up, of course) and a piece of black cardstock. Then I took pictures of the kidlets. Getting a one year old to turn sideways long enough for me to snap a picture was hard, but it turned out to be harder to get a three year old to do it. Once uploaded on to the computer, I cut each of their heads out using the magnetic lasso tool, sized them to all be approximately the same, and printed them out. The pictures I then cut out, turned upside down, traced them with a pencil on the back of the black cardstock, cut them out, glued the silhouettes to decorative acid-free cardstock that I already had lying around, (alright, I actually stole it from the kids' art supplies) wrote each child's name and the year under their silhouette, taped the pictures onto the matte, and put the picture frame back together. Originally, I had planned to get the kids to paint some sort of watercolor for the background behind their heads, but using the cardstock made the whole thing go a lot faster and I realized I didn't really want to give my one year old access to watercolors. So here's the result. I think my mother-in-law will enjoy it. Very, very nice! I can tell, even from this far away, how much they resemble the children. I believe the tutorial was from By Sun and Candlelight. I love that!!!! But even though you say it takes no talent, I don't think I could pull that off. That really is gorgeous though. If you can handle cutting and pasting (and I know you made it out of Kindergarten) you could do this project. I love them. They came out so well. These are really lovely. I may steal your idea for a future time. Thanks for sharing. That is gorgeous! Even if it's as easy as you say, it's got to be a little bit time-consuming, and I do NOT know where you get the time! Let's talk about something else, if anyone is still out there. Other than the house and Christmas there are several other things going on in the Adams household. One is an upcoming trip a few months into the new year. My husband, the brilliant young attorney, has managed to garner a six week working jaunt to England. Naturally, the stipend does not include money for a wife and children. Nor does the trip come at a particularly good time, what with us only barely getting into our house by then, but we're tagging along anyway. Although I got to live in Germany while I was in college and travel around the continent, I've never been to England. I've always wanted to go and frankly after all the little ones started arriving, I didn't see international travel as a thing likely to be in my future. Looking at the price of tickets, I certainly am reminded why we never go anywhere. We've gotten our passports. Things are falling into place. Now I need to figure out all the other stuff I need to have to travel with four children, including a one year old. Then I need to know where to take the tykes while their father hangs out in various Inns of Court and quaffs ale with the local barristers. Suggestions? My SIL is from there and having taken her own kids over for long visits she may have ideas... I will ask her and let you know! How wonderful! Do you want a nanny? Will work for airfare, room and board. Your two oldest will certainly remember the trip. Knowing how the boy can out-argue his father, you may want Justin to take him along to the courts one day, just to see what it's like. Are you staying the full six weeks as well? England's not always dependable weatherwise, and it will involve a bit of shlepping, but Mrs. & I really enjoyed Greenwich. You can stand right on the line, get to see Royal Astronomer gear, etc. If you and the Mr. can get out one night, the Globe Theater (Theatre?) is pretty cool. We bought seats rather than the standing room places - it was raining, and she was 6 mos preggers at the time. Yes, Diane we're planning to all be there the full time. Mostly in London, though I think Justin may have to spend a little time in Belfast and Edinburgh. Those details are not yet too clear for me. Yesterday was the anniversary of our buying The Purple House. It's been a long, long year. While we are getting close to being able to live in the downstairs, our workmen never have seemed to feel the same sense of urgency in getting us in there that we would have liked. Of course, they haven't been living on the charity of a kind friend for seven months either. Today was a busy day over there. The chimney sweeps were building our fireplace. We're converting the old coal fireplace into a wood burning one. It will be pretty tiny, but it will allow my spouse to burn things, which will make him happy. The painter was priming the kitchen cabinets and I think the carpenters were working on patching the floors upstairs. The place is a disaster, but less of one that before and if we could just convince the workmen to put a finish on the floors downstairs, we could consider moving in soon. In the meantime, as I consider, with a sigh, the big money pit, I want to mention some of the expenses I never thought of when we went into this. I'm not talking about the price of paint, what it costs to replace structural beams or rafters or anything like that. I'm talking about other things. First, and perhaps the cost that should have been most obvious -- restaurants. Although I have the use of a full, gourmet kitchen where we live, when one is displaced, on-the-go and often on the opposite side of town fixing up a house, it sometimes is difficult to cook at home all the time. We've eaten out and eaten at far more fast food restaurants in the last year than probably in all the years of my life up to this point. Second, clothing was not something I thought a whole lot about in budgeting our renovation. When we moved out of our old house last April, the weather was cool, but warming up. I thought we'd be packed up for a month or two at most. Now, seven months later, my children have all grown and all the clothes I had packed up for them to grow into, are still packed up. All their summer clothes for the hottest months had to be purchased, because those were packed and now I've had to find sweaters, coats and warm pants, because those too are packed up. Finally, and perhaps the most ridiculous expense, also really the most avoidable, has been the library fines. Where we are currently living I don't even have a bookcase. I've found alternative solutions for our homeschooling materials, but I have never come up with a good place for all our library books. When we were in our own home, I had a system and 99% of the time, I knew where the books were, when they were due and I either got them returned or renewed on time. In the past five years, before we moved, I probably racked up a total of $10 or less in library fines on all the family cards together. In the past seven months, we've incurred over $50 in fines. Books slip into places I can't find. I can't seem to keep track of their due dates and everything is in a tizzy. This is not intended to be whiny, but really to act as a cautionary tale. If one must follow in our footsteps and buy a fixer-upper -- consider and expect the unexpected. I still wouldn't call you a spendthrift. You've simply been living more like the rest of America than before--fast food and library fines included. Our hostess took the kids out yesterday and got a tree. They are thrilled and I admit that even I feel a little more Christmas cheer with lights shining. The kids are especially pleased, because the people we are staying with use colored lights (a thing previously unheard of on our tree). When I went up to the attic to dig out the lights I also looked through the ornaments and it didn't take me long to decide that we would not be using their ornaments. All their ornaments are beautiful and glass (such is the life of the childless). I should note that the people we are staying with are going out of town for Christmas, so they don't really care how we decorate the tree and I am sure they will appreciate our not breaking all their ornaments. Our collection of less fragile, wooden and metal ornaments are not reachable at present, so I told the kids they could make ornaments this year. They are quite pleased and crafting away, drawing trees, snowmen and the like to their hearts' delight. To add some interest to the flat paper things they are coming up with, I think we'll be using some of the projects from some great websites out there. Canon Papercraft has just about every kind of paper craft you can think of. They have things designed to be ornaments, but I think my kids would also enjoy adding toys and animals. Another favorite website is The Toymaker. She has great toys for all year round and special sections for all sorts of holidays. I don't know whether they'll want any fish ornaments, but I think they'll have fun making some fish and pretending to catch them. Finally, leave it to Martha to have some interesting craft projects. We might try paper poinsettias or some fancy stars. That should keep us busy for a while, huh? I was wondering when you were going to put 'em to work. Their membership in the Bloggers' Children's Art Sweatshop was about to lapse. Fun solution to your Christmas doldrums! Popcorn or cranberry garland would also occupy an exceptional amount of time, look pretty, and you get to eat the leftovers (of the popcorn, at least). Don't know how it would work with a dog in the house, though. My Mom celebrates Christmas and a few years ago the kids made 90% of the ornaments. My Mom just isn't up to hauling the boxes and boxes up and down the stairs anymore and she decided this was the way to go. The tree looked great and the kids had so much fun. Rebecca just today told me that she wants to make more decorations for Nana's tree. Easier to string than popcorn are mini-marshmallows. They look good with cranberries. I let the boys have colored lights this year. My white lights, which I spent all of $2 on some years ago, were definitely past their prime. They also broke many of my gold glass balls and iridescent glass stars, but we bought some red balls (Jay picked 'em out) and some glass-looking plastic gold and silver stars along with some pretty plastic garland (looks like glass and crystal if you don't look directly at it ;) ) at Dollar General. All in all, the tree doesn't look too bad! We're not living in our own house yet. Some day we may again have our own quarters and I am very thankful for the roof over my head and the comfortable bed, but it is not my own. During this long process of renovation, the lack of my own space has really gotten me down at times, but never more than now as the world around me decorates for Christmas. I didn't grow up celebrating Christmas at all and have only done so for the past ten years. Even during that time since my marriage, it was never a religious holiday for us. This year it has become much more than it ever was before and although that means I should be even more grateful to consider what I have and think about my Saviour who was born without even a normal bed to be laid in, I cannot help but find myself feeling melancholy. We might have a tree, because the couple we're living with are thinking about getting one, but it won't be our tree. We might have stockings (or maybe not, I just don't know right now), but they won't be the family ones we've collected over the years. On a good year, I struggle with making Christmas a time of cheer and happy memories, because it doesn't come naturally to me. I didn't grow up with any of it. I grew up saying, "Bah humbug!" and thinking people who celebrated Christmas were idiots. Yet, I love the music, the lights, the cookies and all, but I don't really know how to do Christmas. What little I have done in the past to make it special for our family, is now all packed away and out-of-reach. I know and can tell myself over and over that it isn't about the things. It's a magical time whether one has the world or nothing and I have a whole lot more than nothing, so what's my problem? I put on my best poker face, smile for the kids, we're doing our very first Advent wreath ever and I'm playing Christmas music on the iPod, but I'm afraid the feel of Christmas is missing this year without a home to decorate and have friends and family visit. I imagine you've got a nativity scene, but if not, you should definitely get one (and it wouldn't hurt to have two ;) ). You ought to be able to find (or make!) a few things you can use to brighten up your quarters. May He pour out abundant blessings on you all! I spent two Christmas seasons in a home that wasn't my own several years ago, so I know this can be tough for you! Advent will be a nice thing to start this year, though, and it is something the children will remember from year to year. My kiddos love it! I hope things cheer up for you...hang in there! I think you have every right to feel out-of-step with the holidays this year, Jordana. How you've managed to weather the stresses of remodeling, homeschooling, and a major faith change with such grace is beyond me! Two nativity scenes is a wonderful idea- one very special, set up by a grown up, on something high, to make mama smile and one very special, set up by children, possibly even made by children that can be reconfigured frequently. Cotton balls and pipe cleaners make good sheep, painted clay or salt-dough figurines, and a popscicle/craft stick stable. Some times craft stores will sell unpainted plaster nativity scenes for children to paint. Children can add to it year by year because after all, who knows how many shepherds, angels, stars, sheep, animals etc. were there. there are so many beautiful Christmas songs about Mary. What better way to celebrate your faith change and season than to listen to these? On a slightly related note (the time of year), we made your gingerbread pancakes this morning and my son, who is in culinary arts, asked for the recipe. They are our favorite cold weather breakfast. Sometimes I think that it is precisely because I DID grow up with it, Christmas can be something of a challenge. I'm grateful for an Advent season that is longer than the Feast that follows. It seems to help me "ramp up".